Jack is an American craft wheat beer brewed with fresh pumpkin, for a delicious, dark hued, Shandy-inspired beer. It’s said that after Jack was barred from heaven, the devil gave him a burning coal, which he promptly put into a carved pumpkin to light his way. Legend has it that he wanders the earth to this day, searching for innocent bystanders to hoodwink into buying him his favorite beer, a pumpkin Shandy. 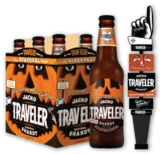 Representing the darker side of Shandy, Jack-O Traveler is an alluring beer illuminated by the tastes of fall. He strikes the perfect balance between bright refreshment and seasonal spice.